I thought it fitting to use a cover photo of one of the late Jim Brothers' D-Day sculptures at the monument in Bedford, VA. On Thursday night of the reunion, Jim showed a slideshow of building the sculptures. But before that, Rangers and families were greeted with the internationally famous sculptor playing a washboard in the Alfred Packer Memorial Band. I received a ton of support from the Lawrence Journal-World, The University of Kansas and the Lawrence Chamber of Commerce as well as many businesses and individuals. Couldn't have pulled off the reunion without them. I went on a treasure hunt today and in a dark cabinet among other old CDs, I found the 2006 reunion book in PDF. I'm such a control freak that I not only wrote parts of the book and edited all of it, I also created most of the ads and did the layout. Of course, that means that any mistakes you find are mine. The book contains stories told by the Rangers, most of whom are now no longer living. Not all the stories are of their combat experiences, but many are. The Rangers were the spearheaders, the first on the beaches of the allied forces that invaded Africa, Sicily, Italy and France and fought their way through Europe. The 1st Ranger Battalion was in combat from the fall of 1942 and added the 3rd and 4th Battalions in the spring of 1943. All three battalions did hard fighting in Africa, Sicily and Italy, participating in D-Day Sicily. D-Day Salerno and D-Day Anzio. They were disbanded after Cisterna when the three Ranger battalions were decimated by an overwhelming Nazi force equipped with tanks and self-propelled guns. The 2nd and 5th Rangers invaded France on D-Day Normandy in June 1944 and fought in the Battle of the Bulge and throughout Europe. The 6th Rangers fought in the Pacific and participated in the raid on Cabanatuan which was portrayed in the movie, "The Great Raid." If you would like to read the book, click here. We know our fathers for all of our lives ... but not for all of theirs. While Grams told me what Dad was like as a boy — mischievous, adventuresome and a risk-taker — and Mom described him as a young man — caring, fun-loving and an avid sportsman — neither knew much about his service as an Army Ranger officer in World War II. They didn’t know because, like many combat veterans, Dad didn’t tell. Perhaps he wanted to forget or simply realized that those who hadn’t experienced combat couldn’t understand. My quest to learn about Dad’s military experiences began because my mother, his widow for three decades, wanted to know about those missing years. When she died in 2004, my mission changed. I now seek information for my sisters, for my children and theirs. And to learn about the father I didn’t know. Ray and I recently attended a mini-reunion of WW II Rangers at a beautiful resort on Iowa’s Lake Okoboji. There I met 84-year-old Sgt. Les Cook — winner of Silver Stars in World War II and Korea and wearer of a Green Beret in Viet Nam — who rides his bicycle 40 miles daily. Cook, with 1,004 parachute jumps to his credit, is an original Ranger who was trained in Scotland by British Commandos. He admits he was unimpressed when his captain called him in and introduced my father, who had joined the Rangers in Africa, as his new lieutenant. The Rangers were fairly strict in accepting only single men, so the jury is still out on whether Dad concealed that he had a wife and three children. Personally, I think that Dad’s fluency in German and knowledge of Italian and French may have made him a valuable acquisition in spite of his family baggage. “That’s exactly what happened,” says Cook, “It worked out O.K.” But he is still surprised that Dad, who at 26 was an old man for a Ranger, listened to and learned from his 19-year-old subordinate. I told Sgt. Cook that I grew up with this advice from Dad: “There isn’t anyone, Marsha, who doesn’t know something that you don’t ... and if you close your mind to that, you will never learn what they have to teach you.” Dad obviously was following that advice long before he gave it to me. Perhaps the father I didn’t know was the father I knew all along. Happy Father’s Day to all fathers ... and especially to Ray who changed his sons’ diapers long before it became cool for fathers to do that! It goes without saying that we honor those who died under foreign skies in World War II, but in the above ad for a Ranger reunion book, which I recently found in a rarely-opened folder on my computer, I honor my father and those who did return, the majority of whom held the nightmares they had witnessed at bay and returned to the lives they left. But I do not honor my father alone with my vote. I honor all American veterans who fought in every American war: the Revolutionary War, which gave us our freedom from Britain; the War of 1812, often called “the second war for independence” which preserved it; the Civil War which freed all of our citizens; the Spanish American War which ended Spanish colonial rule in the Americas; World War I, termed “the war to end all wars” that did not; World War II, which halted Axis plans to rule the world; the Korean War, dubbed a police action; the Vietnam War; Desert Storm, Iraq, Afghanistan . . . so many wars. And so many veterans who fought to preserve our freedom. Many of them gave their all, dying under foreign skies. Others, like my father, came home to build homes and families and communities. I honor them all. There is a common email that periodically makes the rounds: If you can read this, thank a teacher. If you can read it in English, thank a veteran. I do most sincerely thank each and every veteran for his or her service. Above is the latest issue of MZB (Fall of 2016. To read, just click on the image. 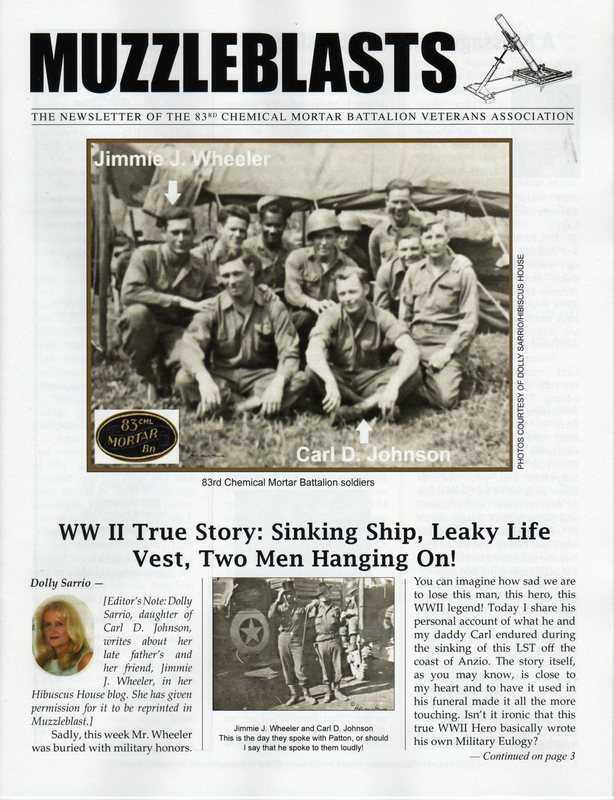 ​I produce a quarterly newsletter for the 83rd Chemical Mortar Battalion, a World War II unit also known as "The Rangers' Artillery." After Darby's Rangers were disbanded following their decimation at Cisterna, my father, who said the Army never gave him many choices, took advantage of one choice he was given and joined the 83rd CMB for the remainder of the war. Eventually, I will post all of the issues I have. Available now on Kindle. A Crazy Plan: Darby's Rangers' Heroic Last Stand at Cisterna is the story of one of World War II's most heartbreaking battles, told by those who fought it. Only eight Rangers out of the two battalions who marched up the canal to Cisterna escaped; the rest were killed or captured. The 4th Ranger Battalion fought desperately to crack the ring of Germans surrounding their brother Rangers in the 1st and 3rd Battalions. In doing so, they suffered more casualties than the other two battalions combined (POWs are not considered casualties). The book is quite short, but it contains information that has not previously been available. I originally planned for it to be longer, but one of the Rangers I interviewed was very ill and I wanted his story out there while he was still living. RIP Carl. Then last August, Micky Romine, another heroic Ranger who tells his story in the book, died a few days after Ray and I attended his 94th birthday party at a VA Home in Missouri. A medic, Micky went AWOL from a hospital where he was being treated for an injury because he was determined to march into battle should his battalion need his services. With two other medics, he set up an aid station in Cisterna. He was captured and spent the remainder of the war as a POW. You may click on the cover to buy the book on Amazon for $2.99 or to read a few sample pages. 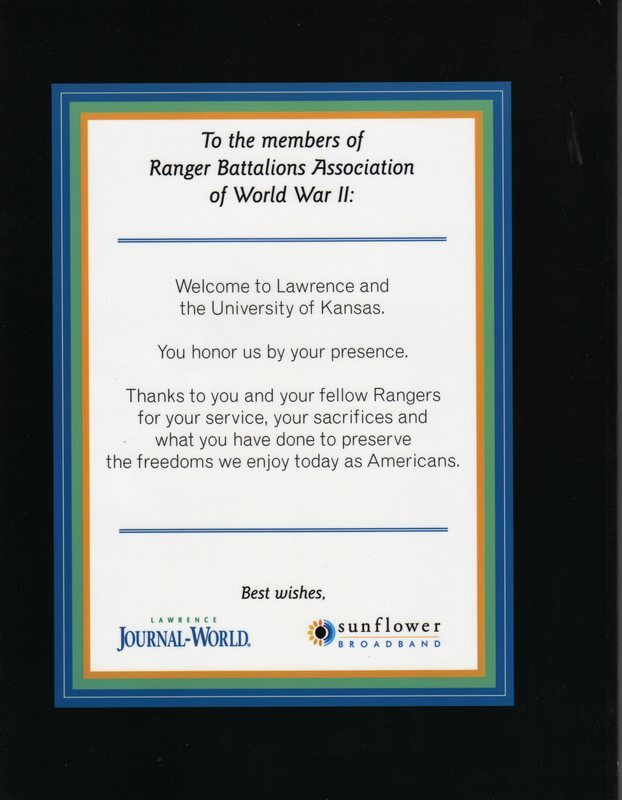 I produced this book for the WW II Rangers when they held their national reunion in Lawrence in 2006. 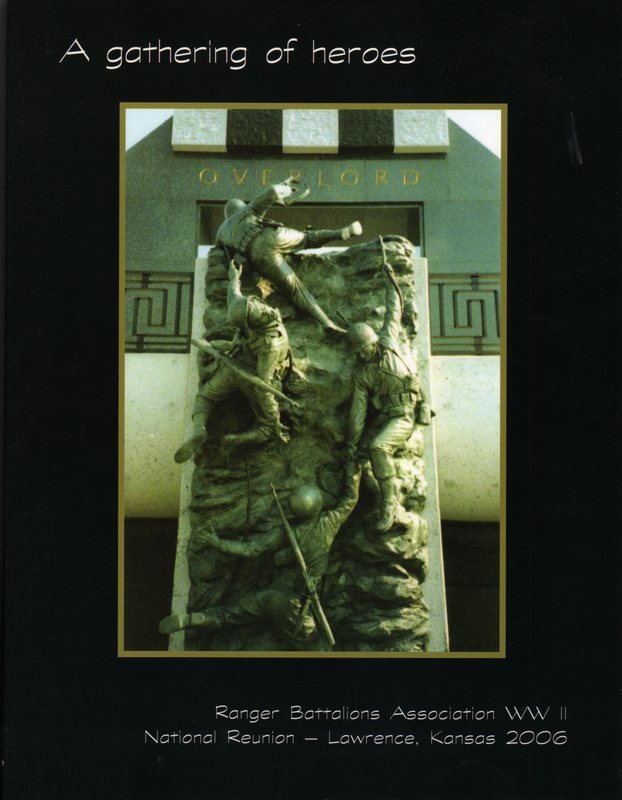 It is no longer available, but I think you might like to see the book's cover, a photo of the sculpture "Scaling the Wall" which depicts Rangers climbing the cliffs at Pointe du Hoc. The late sculptor Jim Brothers created magnificent sculptures at the 50-acre monument to honor those brave Americans who fought and died at Normandy on June 6, 1944 and subsequent days. 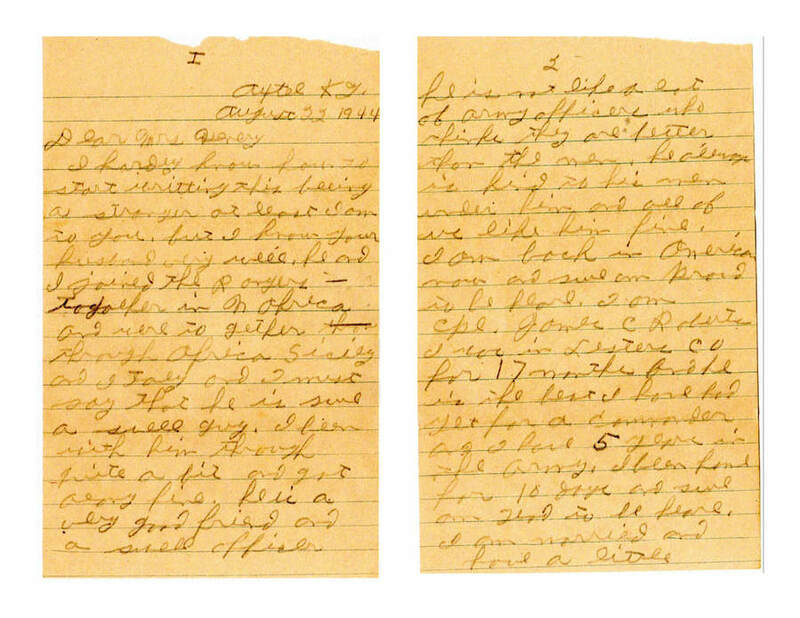 about her book, A Wyoming Cowboy in Hitler's Germany. If you would like to watch it, please click here. As the daughter of a World War II Darby’s Ranger, I have read, researched and written much about warriors of the Greatest Generation. I know how much work goes into even the shortest of combat articles. 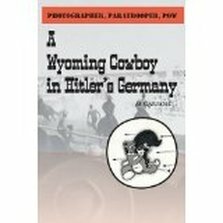 Therefore, I was astonished at the depth and breadth of the historical research contained in A Wyoming Cowboy in Hitler’s Germany, as well as the author’s ability to transmit it to the reader in an interesting and thoroughly enjoyable fashion. Through the adroit use of photos, letters, documents and prose, the author brings to life — from boyhood through World War II — three All-American brothers, each of whom worked his way up to the rank of officer. All three left for war: a commander/paraskier, a submarine navigator and a photographer/paratrooper. The two paratroopers were reported missing in action during the Normandy D-Day invasion. One of them was later documented to be a German prisoner of war. Of the three brothers who marched off to battle, only two came home. This book relates a compelling story, skillfully written. 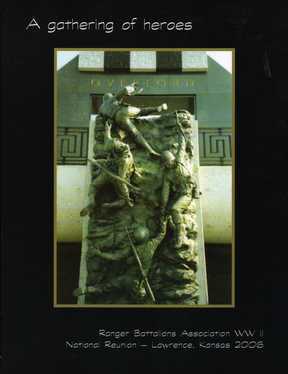 It is a must read for those who love history and especially those fascinated by World War II history. their reentry into civilian life. Happy Father's Day to Veterans! that I wrote about my soldier father. 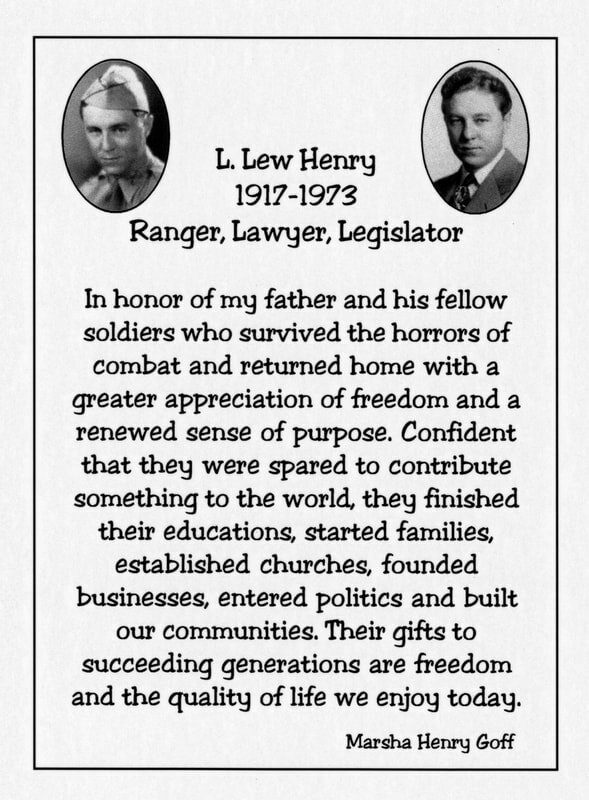 My interest in WW II history is due to my late father, L. Lew Henry, who was a Darby’s Ranger in WW II, serving as a lieutenant in both F Company of the 1st Ranger Battalion and A Company of the 4th Ranger Battalion. He began the war in Africa, fighting through Sicily and Italy, and was wounded during the Anzio invasion, causing him to miss the disaster at Cisterna. After recovering, he fought on Anzio Beachhead with the First Special Service Force under the command of General Frederick. After Darby’s Rangers were disbanded, he joined the 83rd Chemical Mortar Battalion (aka "The Rangers’ Artillery"), fighting with them through France, Alsace, and Germany until the Nazi surrender. The invasion of Sicily was a bloody battle . . . so costly in human life that one Ranger participant said if that (or any) WW II invasion could have been shown on television, the American people would have said, "Bring them home!" The Cisterna debacle in which Rangers of the 1st and 3rd Battalions were surrounded by an overwhelming German force and, with the exception of only eight men, were all killed or captured. Several former POWs from the Cisterna battle contributed to this article. Click HERE for the article about 1st, 3rd and 4th Battalion Rangers. Click HERE for the article about the rescue of POWs held at Cabanatuan. D-Day appears to be the only WW II action that many reporters of the present day are aware. That fact is readily apparent in the way they bypass interviewing brave veterans of the 1st, 3rd, 4th and 6th Ranger Battalions in favor of those equally brave 2nd and 5th Rangers who participated in the D-Day invasion. That said, D-Day was an amazing wartime feat by the allies. The assault on the Normandy cliffs was both daring and deadly and depicted by sculptor Jim Brothers in larger-than-life-size-scale at the site of the D-Day monument in Bedford, Virginia. The stories by participants and photos in the following article make it worth reading. Click HERE for the D-Day article. Click HERE to read about Franck and the Rangers whose graves his family decorates. L. Lew Henry, my father, was in the 1st and 4th Ranger Battalions and in Companies D and A of the 83rd Chemical Mortar Battalion. To read a short booklet, The Lost Ranger, which I wrote about him, click ﻿HERE﻿. Bill Munoz was in the 5th Ranger Battalion in World War II. To read his story, click HERE. Stitt Robinson participated in two glider invasions in World War II. To read his story, click HERE. Crosby "Bing" Powell was in the 34 Infantry. To read his story about the battle at Monte Casino which I wrote for Topeka Magazine, click HERE.